Intel just announced Thunderbolt 3 with a USB-C connector supporting single-cable support for dual 4K displays. Thunderbolt was developed to simultaneously support the fastest data and most video bandwidth available on a single cable, while also supplying power. USB-C is the new industry-standard connector and cable used for connectivity and power. It was developed by the USB Implementers Forum, with over 700 companies in its membership, including Apple, Dell, HP, Intel, Microsoft, and Samsung. USB-C connector is smaller than traditional USB and is reversible. It’s one compact port that does it all. Its important to noteNot all USB-C connections will support Thunderbolt 3. All Thunderbolt 3 connections will support USB-C. Thunderbolt 3 is chip-controlled and requires the new Alpine Ridge chip to control it. More than likely, well see computers come out with USB-C ports and Thunderbolt ports which both have the same connector, but the Thunderbolt ports will be much more powerful. Thunderbolt 3 also supports more protocols than any other I/O controller, making it compatible with virtually any dock, device or display. Also, solutions and products built to Thunderbolt and Thunderbolt 2 specifications will work with Thunderbolt 3 via an adapter. USB-C connections are still very new. Apple released their new MacBook and Google announced their Chromebook Pixel just a few months ago. 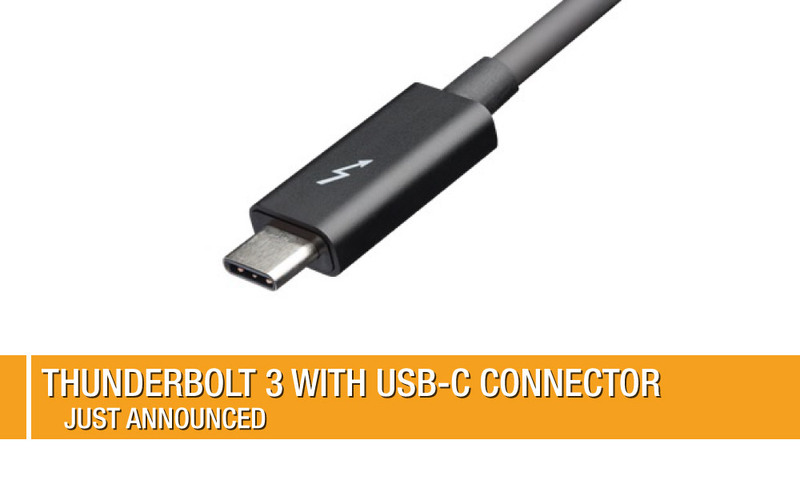 Intel expects to start shipping Thunderbolt 3 products by the end of 2015, ramping up in 2016 as more computers come equipped with USB-C connections. It’s likely that new devices will require Intel’s next-generation Skylake processors. Well keep an eye on new computers with USB-C connections coming to market. Apples Worldwide Developer Conference keynote is slated for June 8, 2015, where the might announce a refreshed line of products. One of the things not mentioned is Thunderbolt is a daisy chain architecture, while USB is a hub and spoke model; so what is Thunderbolt 3 daisy chain or hub? Granted I think the daisy chain mechanism is largely why Firewire and Thunderbolt never gained traction outside of Apple. I have a dozen or more devices hooked up to my computer, doing that daisy chain would be nuts, particularly when you have two devices with only end points like almost every device in the USB world. Thunderbolt also exits in the PC world. HP uses it a lot on their pro workstations.